36″ x 48″ (91 x 122cm) acrylic on canvas 2008. Following his unexpected death in 2017, to celebrate Chris Gollon’s life and work, the award-winning River & Rowing Museum, Henley-on-Thames, has re-arranged its exhibition schedule to display his painting of the Henley Royal Regatta. The painting was commissioned in 2008 and is now part of the Museum’s permanent collection alongside works by Dufy, Piper and Trevelyan. The museum have also displayed an example from each of the the four editions of silk-screen studies Chris Gollon produced on his way to completing the main work. 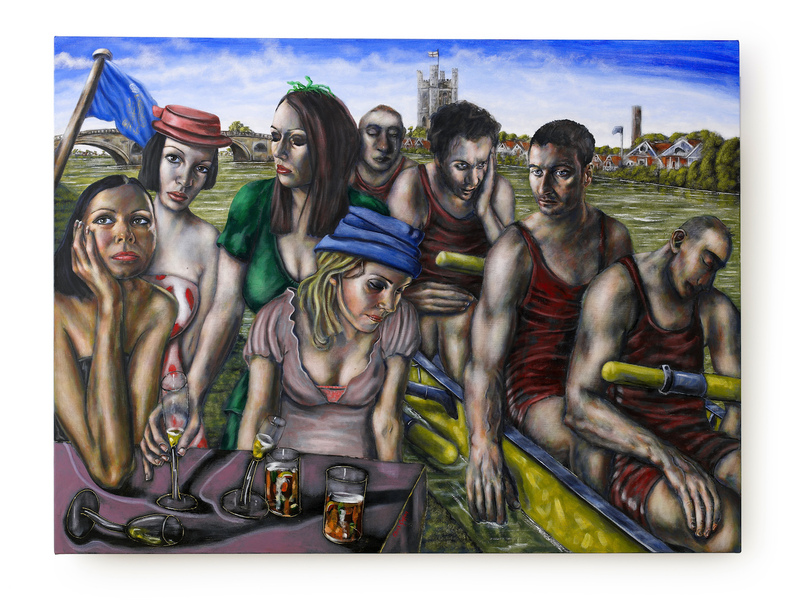 Since most people’s experience of the Henley Royal Regatta is losing (there are no silver or bronze medals), Chris Gollon chose to depict and focus upon the losing rowers. ‘Gollon At Henley’ (pictured here and in the current display, 36″ x 48″, 91 x 122cm, acrylic on canvas 2008) was unveiled in 2008 to much acclaim, including this excellent review by Simon Barnes: The Times. The River & Rowing Museum is open daily 10am – 5pm: Location & Times.